Harvest while young and tender early in the season, or leave them to bulk up as they'll stand well in the ground for you to harvest as you need them. Sow the seeds thinly and evenly 6mm (1/4in) deep in moistened potting mix and cover them lightly with vermiculite or sand. Keep the soil temperature at about 70°F until the seeds germinate. Move the seedlings under grow lights or into a very bright window. Transplanting: When the seedlings are about the diameter of a pencil, they are ready to transplant outside. Planting deeply helps to blanch the stems. Use a dibber (or a rake handle - great for making perfect holes). and make holes 15cm (6in) deep and 22cm (9in) apart. Make the rows 38cm (15in) apart. Mark the row clearly so that, when weeding later you don’t remove plants by mistake. On the allotment seeds are best sown in rows, 35 to 40cm apart. Mark a straight line and use the corner of a rake to make a shallow groove in the soil, about 1cm deep. 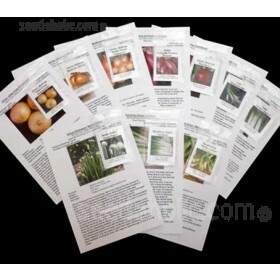 Sow seed thinly along the trench, cover with soil, water and label. When seedlings have three leaves each, about four to five weeks later, thin to leave plants every 15cm – the seedlings you remove could be used to plug gaps elsewhere. They will keep in your refrigerator for at least a month, but the quality will not be as good as when freshly harvested. The variety and packaging will affect the storage life. And digging the plant up doesn't stop it's growth - it will continue to grow (very slowly) for months even under refrigeration, but this growth reduces the quality of the stems. Leeks are relatively easy to grow, and have a pleasantly sweet mild onion flavour, and depending upon variety, can be harvested from mid-summer, through the autumn and winter, until late spring. This ability to provide a crop through the winter months is very useful at this lean time of year. A range of varieties (cultivars) with differing times of maturity ensures the widest cropping period, though leeks have the ability to stand in the ground over a lengthy period without deterioration. Although many growers will choose to grow just one or two varieties, leeks are available six groupings to ensure the very longest cropping season, from late July stretching through to April of the following year. These six groups are derived from commercial usage, rather than botanical differences. These are varieties possibly derived from ‘Copenhagen Market’ which give tall slender stems (greater than 250mm) with pale green leaves that form an acute angle to the stem. 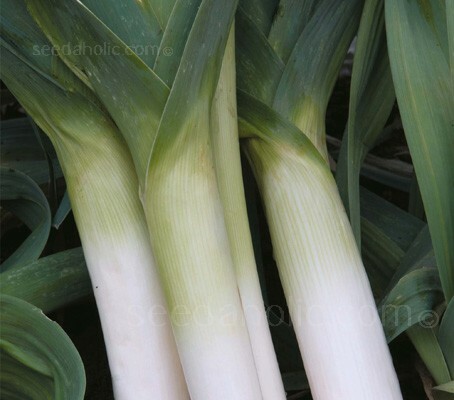 On the continent they are known as ‘summer’ leek, and in the UK are suitable for cropping from August, September and October, but cannot stand in the ground later than this as they are not winter hardy. Also called Gennevillier types, they are similar to early leeks (type 1), but with stouter stems. Some varieties are a little shorter in length but their season of cropping may be extended into late November/early December. These are the true mid-season leeks, recognised as traditional crops at this time of year. These varieties are usually very vigorous, with a stem of medium length (c.120mm) and very stout. The leaves are broad and extensive and mid green in colour. ‘Elephant’ and ‘Mammoth’ frequently occur in the variety names. They are suitable for harvesting from October through to February in all but the most severe winters. These are the continental ‘winter’ leeks - medium short stemmed (c.100mm) with dark green foliage. They are useful for cropping during the December to April period. These are the most winter hardy of all the leeks, immediately recognisable by their dark green leaves which assume a purplish tinge in cold weather. The leaves extend from the stem at an obtuse or broad angle. They have short stems and are really only suitable for growing as transplants in dibbled holes (to increase length of stem blanching) These types, which include such varieties as ‘Blue Solaise’ should only be harvested late in the season, as much of their yield increase is derived from early re-growth in February and March. The leafy top is often referred to as the ‘flag’ and its colour can vary from variety to variety, from pale bright green through to a darker deep green to a blue-grey green. Leaves may grow at varying angles to the stem, again depending upon variety; the earlier maturing varieties usually being at a more acute angle. Best sown in rows, 35 to 40cm apart.